Star Wars is one of the most recognisable franchises in popular culture. An empire that spans from blockbuster movies to toys to books, there are hundreds of stories set in this universe. One such tale focuses on a squad of elite clone troopers sent on dangerous missions during the Clone Wars. Released in 2004, Republic Commando is a dark, uncompromising game that challenges you at every turn. Yet, despite having an overwhelming number of positive reviews on Steam, the game has completely faded from public consciousness. What went wrong? And how did a game with so much promise become a hidden gem in the Star Wars enterprise? Star Wars Republic Commando is in our list of the best Star Wars games on PC, and it’s in good company. 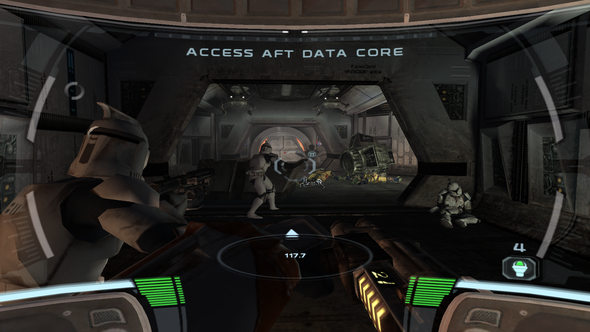 For the unfamiliar, Star Wars: Republic Commando is a squad-based, first-person shooter that puts you in the role of Delta Squad leader, RC-1138, aka “Boss.” Broken up across three core locations, the game’s journey tasks you with disrupting manufacturing on Geonosis, investigating a derelict spaceship, and freeing Wookies on Kashyyyk. 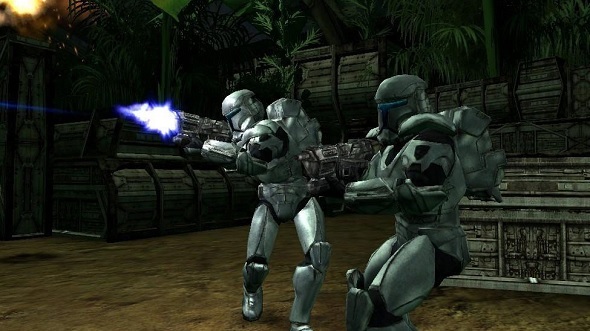 The additional three clone troopers act independently, but can be given direct orders to follow, such as taking up sniping positions, regrouping, hacking terminals, and planting explosives. This creates a unique blend of fast-paced shooting and tactical gameplay that few Star Wars games have been able to replicate. These mechanics are wrapped up in dark, mature themes that wipe away the surface veneer other Star Wars games exhibit. There is no opening crawl, the Jedi are simply an afterthought, and familiar iconography we associate with the series is pushed to the background. That ethos was reflected in Republic Commando’s difficult gestation. As development entered its final phase the team worked under the constant threat of redundancy due to internal restructuring brought about after the appointment of new LucasArts president Jim Ward. The ailing division was to be rebooted, and so Douville’s team began to shrink as tasks were completed and roles removed. “Many of the folks on that team I had worked with throughout my LucasArts career, including EP Daron Stinnett, creative director Tim Longo, and level designers Greg Land, Harley Baldwin, and Troy Mashburn, artist Patrick Sirk.” Douville says. “But all of the team were really excellent at what they did. 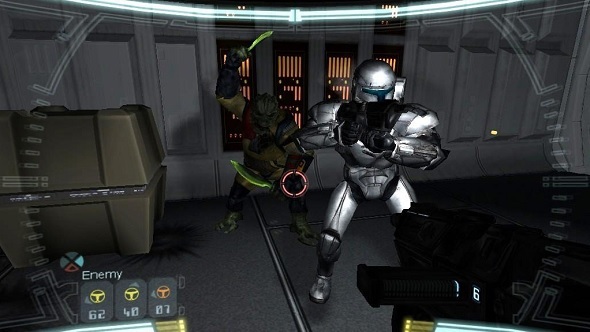 While these stresses were among the primary factors as to why Republic Commando never received a sequel, there was always the looming shadow of other Star Wars games. During the same release year, both Star Wars: Battlefront II and Lego Star Wars: The Video Game came out. While the latter was a vastly different take on this universe, Battlefront II posed some serious issues for the team making Republic Commando. Both games focus on the soldiers during The Galactic War, however, Battlefront II took players to iconic locations from the films. This was one of its prime selling points, as the idea of stepping into the shoes of a soldier during the battle of Hoth was, for many fans, irresistible. Additionally, the Battlefront series had already built a name for itself that was shaping up to be one of the defining games set in this universe. 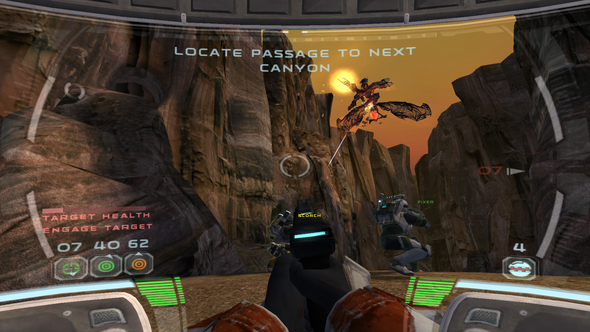 The multiplayer component of Republic Commando that Douville describes is simply a collection of traditional competitive staples like Team Deathmatch and Capture the Flag. It lacks the tactical gameplay that the single-player delivers and fails to bring anything new to the table. 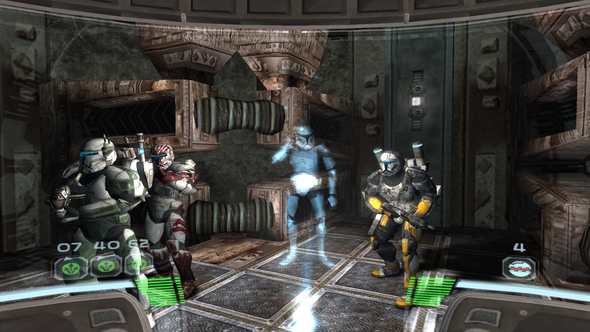 All of the unique qualities that make this game standout are washed away once the battle is taken online – Republic Commando is no longer about reflecting upon the horrors of war and the people involved. There has never been a true sequel to Republic Commando and fans have only heard small rumours of a follow-up coming down the line. Yet, there is still a glimmer of hope that the game’s outstanding single-player could eventually surface. Even though much of the Star Wars Expanded Universes’ stories are no longer considered canon, it turns out Delta Squad still is. They briefly appear during an episode of Star Wars: The Clone Wars television show, titled “Witches of the Mist.” Despite everything Douville and his team have gone through, then, there is still a small chance this squad will make a return in videogame form. All we can do is hope.